One Hundred and One Dalmatians (film) Animated feature about Pongo, a clever Dalmatian, who arranges to get married to the female of his choice, Perdita, and to round things out, gets his master, Roger Radcliff wed to Perdita’s pretty mistress, Anita. Soon Perdita produces 15 puppies, which the evil Cruella De Vil arranges to have kidnapped in her quest to make a fabulous Dalmatian-fur coat, also gathering many other puppies in order to accomplish her aim. Helped by the Twilight Bark, whereby dogs throughout the city and the countryside pass along the word of the missing puppies by barking, Pongo and Perdita go into action and locate 99 stolen puppies in Cruella’s sinister-looking home, Hell Hall. Pongo, Perdita, and the puppies manage to escape and through various ruses elude the pursuing Cruella. Cruella and her henchmen, Horace and Jasper Badun, get their just desserts. 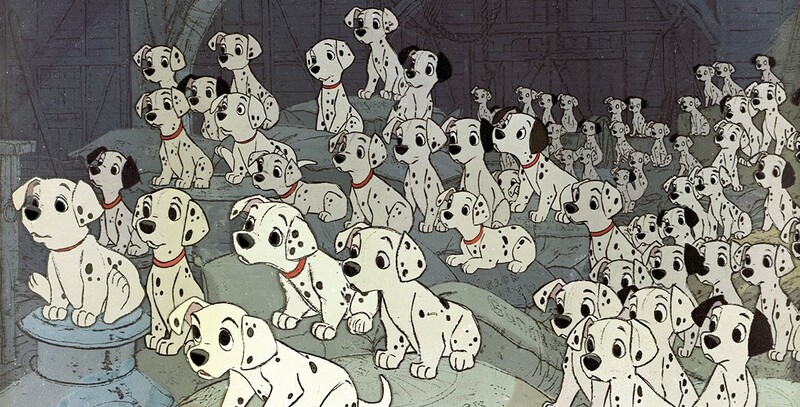 Roger and Anita adopt the puppies, and with their new family of 101 Dalmatians and Nanny to look after them, plan to build a “Dalmatian Plantation” and live happily ever after. Released on January 25, 1961. Directed by Wolfgang Reitherman, Hamilton Luske, Clyde Geronimi. Based on the book by Dodie Smith. The songs “Cruella De Ville (sic),” “Dalmatian Plantation, ” and “Kanine Krunchies Commercial” were written by Mel Leven. Costing $4 million, the film did phenomenal business on its original release, and in its subsequent reissues in 1969, 1979, 1985, and 1991. Released on video in 1992. It was the first feature to solely use the Xerox process for transferring the animators’ drawings to cels. Prior to this, each one of the animators’ drawings had to be hand traced in ink onto a cel. The new process sped up production greatly, especially in a film that had so many dogs, and not just dogs, but spotted dogs. It would have been horribly time-consuming to hand-ink each of the cels. Voice actors include Rod Taylor (Pongo), Betty Lou Gerson (Cruella de Vil), Lisa Davis (Anita), Ben Wright (Roger), and Cate Bauer (Perdita). 79 min. The famous Twilight Bark, used to rescue the puppies, was later adopted as the name for the newsletter for Disney Feature Animation. Note the spelling of Dalmatians. This word is probably the most-misspelled Disney word, with most people misspelling it “Dalmations.” Dalmatia, however, is a place, so people, and dogs, from there are Dalmatians.